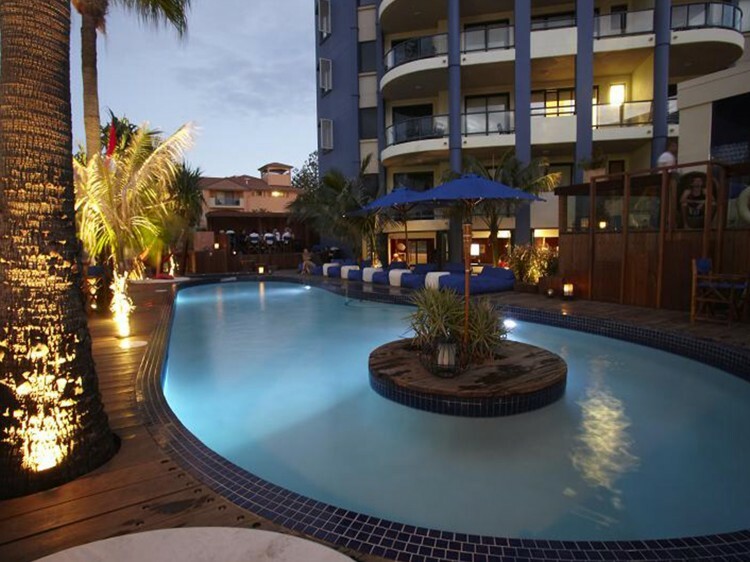 Komune Gold Coast, the new entertainment and accommodation hub for surfers and travelers who enjoy the beach lifestyle. Enjoy a magical location fronting world-class surf breaks, exotic design, great beats and a friendly community spirited atmosphere. Komune is dedicated to connecting adventurous, fun-loving, environmentally conscious travelers who share a passion for surf and beach culture. 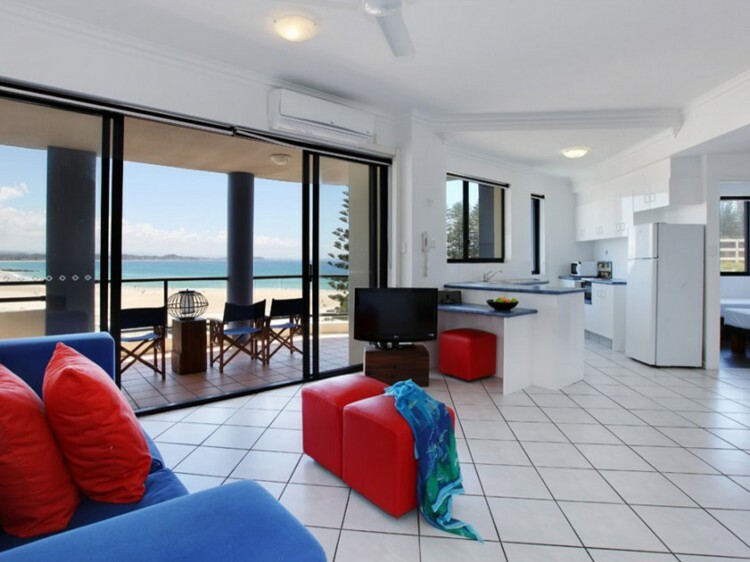 Komune provides a variety of stylish accommodation to suit all budgets, from share accommodation through to apartments and luxury penthouses, each room is designed with the beach lifestyle in-mind. Designed as your all day place to hang, re-charge and charge! Kick back and listen to tunes, trawl the net, check the waves and mix good times with good people. 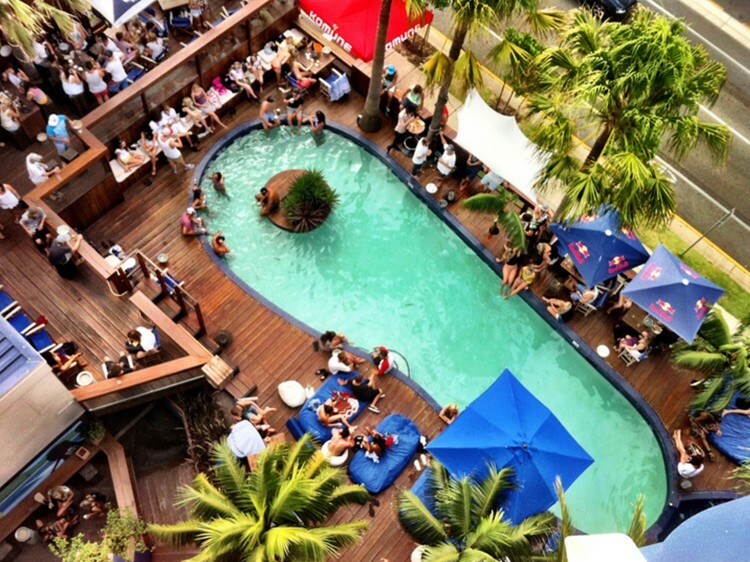 Unlike most hotels, on weekends you'll find a vibrant scene in the Beach Club with local and international DJ sets and some delicious live acts and poolside sunset sessions. The fully licensed public Beach Club hosts regular DJ sets, fashion parades, corporate and casual events and live entertainment and may at times not be suitable for families with young children. Sit back with the latest movies and sporting action on the pool deck with personal noise cancelling headsets, or go for highest score on the beach club’s classic arcade machine. Fresh, local, organic produce is used for a simple southern Cali inspired "Playa Taco" Mexican cantina. Those with a thirst can get quenched with a cold beer or sublime cocktail at the bar! Komune's Beach Club includes the world's first beachfront cinema with a view ocver the pool party, the ocean and the harbour. 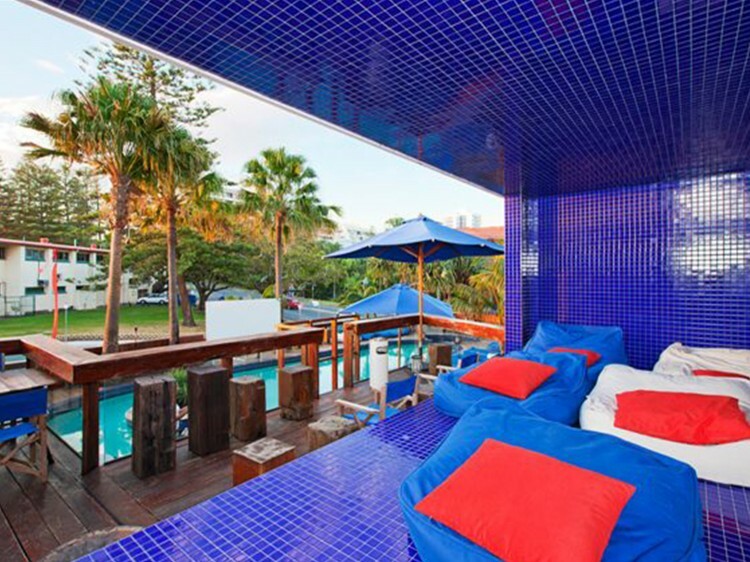 Known as the Blue Room, Komune live streams daily webcasts of the latest surfing and sports events. Each night, Komune screens a latest release movie (posted at reception daily). Komune provides you with noise cancelling aerial headsets while you sit back and relax in the cinema with a cold drink and pizza. Feature a separate bedroom and living area overlooking the magnificent Pacific Ocean. Located on level 8 featuring a separate bedroom and living area. Enjoy the expansive ocean and hinterland views from your own private balcony. This luxury 9th floor occupies one whole floor and commands 360 degree beach and harbour views with an ultra modern design. The K-Luxe has been designed to encapsulate the luxury side of the surfing and beach lifestyle with amazing spaces to chill. The Komune Luxury Apartment includes Bose Surround Sound System and a playstation nook. Bedding consists of a pull down king size bed and 3 double day beds in the living area. Access is via one flight of stairs. Parties and large gatherings of people in Komune's accommodation rooms (without prior hotel authorisation) is strictly prohibited. Any breaches of this policy will result in immediate termination of your booking without refund.